MAXIM Integrated Products, represented by Arrow Electronics , has introduced the MAX3246E three-transmitter, five-receiver RS232 transceiver in a tiny UCSP. UCSP packaging saves 55% board space over existing solutions. Integrating three transmitters and five receivers, the MAX3246E is ideal for PDAs, notebook and desktop computers. Integrated electrostatic discharge (ESD) structures eliminate the need for additional external components. The MAX3246E protects data lines up to ±15kV per Human Body Model, ±8kV per IEC 61000-4-2 Contact Discharge, and ±15kV per IEC 61000-4-2 Air-Gap Discharge. 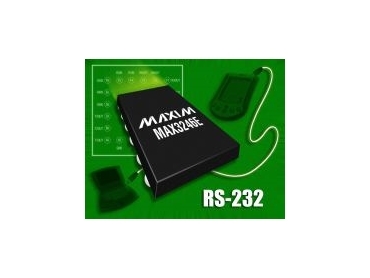 The MAX3246E transceiver operates from a single 3.0V to 5.5V supply, utilising a regulated dual charge pump to provide RS232-compliant output voltages. This device features a power-saving 1 microamp shutdown mode, draws only 0.3mA of quiescent current, and guarantees operation at data rates up to 250kbps. The MAX3246E is available in the commercial and extended temperature ranges.